Via: TVLine.com, by Megan Masters: Showrunner Scott Buck discusses Deb’s ultimate sacrifice and how it will impact the conflicted cop — and her relationship with Dexter — in Season 8. He also reveals the reasons behind the ill-fated LaGuerta’s ouster, why Hannah likely isn’t gone for good and what will happen if Showtime opts to keep the ratings-rich Dexter around beyond its proposed final season. TVLINE | Has Deb now been “born in blood” — in a shipping container — just as Dexter was as a child? That’s interesting, I hadn’t thought of that. But you could certainly say that, yes. TVLINE | What will Season 8 Deb look like? How will killing an innocent – and someone she cared about — affect her? It’s certainly going to be different from Season 7. What’s so different about this kill, as opposed to anything that Dexter does, is that it was done of out love; it was done to protect someone she cared about. Read the rest, after the jump. TVLINE | Will Deb’s actions help bond her to her brother? Or will it ultimately splinter their relationship? It certainly bonds them, but some of the things that can bond people together are not positive. It’s less a bond out of love than a bond out of tragedy. And that will affect their relationship in the coming year. TVLINE | Talk about Deb running into a then-dead LaGuerta’s arms after killing her. You’ve said that the choice to do so was Jennifer Carpenter’s. The way I scripted it was simply that Deb shoots [LaGuerta] and then Dexter and Deb share a look. We would then cut to them walking through the New Year’s Eve party. But this actually added a really nice transition. We did it that way in all the takes, so there were no alternate endings. 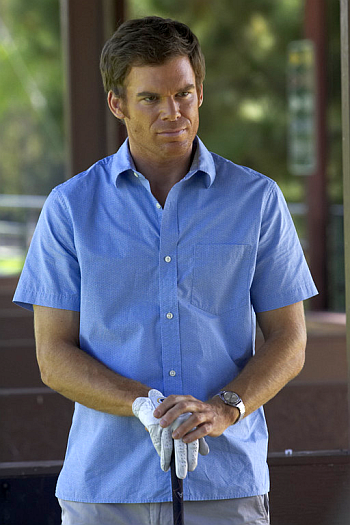 TVLINE | You’ve said that Season 8 will really explore Dexter’s origins. Can you elaborate on that? We will expand what we already know, and see that there’s actually a lot more to it than we had imagined. I can’t get into it too much without giving things away. But there’s part of the story that we haven’t told yet. TVLINE | Any idea yet where you’ll pick up next year? We’re still in the process of writing and creating, so we don’t know that just yet. TVLINE | With the through-the-roof ratings you’ve had this season, has there been talk of a Season 9? Or are you still going into 8 as if it’s the end? That’s a question that I don’t get to decide, unfortunately; it’s a Showtime question. We’re approaching this last year as though it’s the finale, and if something changes then we can alter our course. TVLINE | I have to assume that Angel will be hit pretty deeply by LaGuerta’s demise. Perhaps even un-retiring? We have no intention of losing [series regular] David Zayas or Batista. He’ll be back with us. LaGuerta’s death will have a huge impact on Angel. This is not just a coworker and a friend, but someone he was once married to and has very deep feelings for. How he puts this in perspective and deals with it is going to be a large part of his character’s journey next season. TVLINE | Regardless of how well Deb and Dex are able to fake LaGuerta’s murder scene, someone has got to find the timing of her death pretty suspect. My mind immediately jumps to Matthews. Right. We hope to definitely bring back [Geoff Pierson as] Matthews… We’re still making deals right now. TVLINE | How will her murder take a toll on Miami Metro? It’s going to have a huge impact. This is a character who’s been with us since the very beginning and has always been a very strong, central character to the show and to Miami Metro. So, you’re definitely going to feel a vacancy there. TVLINE | Talk about the decision to have LaGuerta be the one to uncover Dexter’s secret. What was interesting about it was that [LaGuerta] was never really highly respected for her detective work, but rather for her ability to be politically smart. So, it seemed interesting to show that that wasn’t quite true and that she’s a much smarter detective than anyone had imagined. Essentially, that was the reason. TVLINE | How did Lauren Vélez take the news of her impending departure? We told her perhaps half-way through the season. Everyone’s always disappointed or sad to leave a show that’s been so important to them for so many years, but she was very excited to play such a vital part in the season. And she was fantastic! TVLINE | Let’s talk about Hannah, who developed into such a great character. Since she’s still out there somewhere, is it possible that Yvonne Strahovski might be back? That Hannah and Dexter could eventually have something real? TVLINE | Does that mean there wasn’t any truth to the discussion she and Dex had in prison: that together, one of them would have to end up dead or behind bars? I think they absolutely believed everything they were saying in the moment, but things can always change. TVLINE | Was the plant that Hannah left for Dexter a goodbye or an “I’m still around” warning sign? It was a black orchid, so it was meant as a rather ominous goodbye. TVLINE | I have to imagine that this is it for Dexter romance-wise. Either he reunited with Hannah or he goes solo. I don’t know that Dexter can easily move past Hannah. Even though he’s had other relationships in his life, this was the only truly honest relationship he had; the only instance in which he felt he was in love with someone. Who knows, years later he might be able to move past it, but I don’t think in this upcoming season he’s prepared to. TVLINE | Some fans aren’t buying Hannah’s confession that she poisoned Deb. Are we to believe that she really did it? Well, it was as much of a confession as Hannah will ever give. TVLINE | The belief is that Deb actually poisoned herself — but that wasn’t what you were going for? It’s fun to think so! [Laughs] We’re more than willing to let the viewers’ imaginations take them wherever they want. It’s probably closer to the beginning of the end, but it all depends on which character you’re talking about. It will affect them both in different ways, but it’s certainly going to take them to a new place in both of their lives.